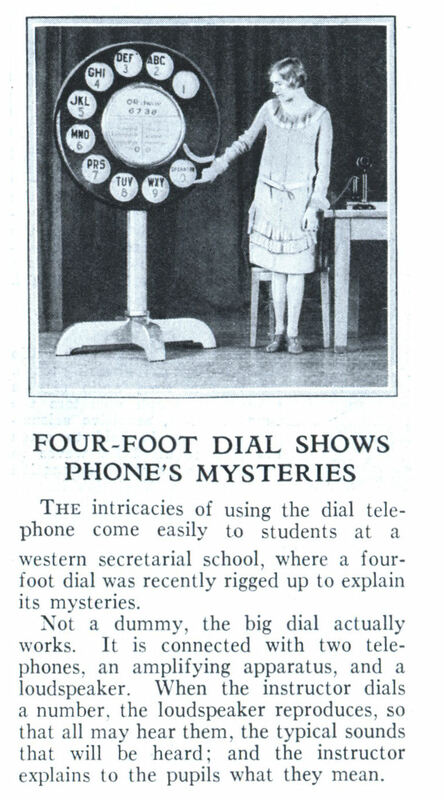 The intricacies of using the dial telephone come easily to students at a western secretarial school, where a four-foot dial was recently rigged up to explain its mysteries. Not a dummy, the big dial actually works. It is connected with two telephones, an amplifying apparatus, and a loudspeaker. When the instructor dials a number, the loudspeaker reproduces, so that all may hear them, the typical sounds that will be heard; and the instructor explains to the pupils what they mean. Wow, that’s bizarre. Why would you use a dial for that? Wouldn’t it be easier to just use push-buttons? I mean you need a microcontroller anyhow to insert your number into the D-channel, don’t you? Any chance you looked at the date of the article? Casandro, even. Sorry for typo’ing your name. If the dial itself is 4ft, then the woman’s rather tall. If the whole contraption is 4ft, then she’s a dwarf. I’d love to own all this giant stuff, I’d keep my giant phone dial next to my giant typewriter and put them both in the rumble seat of my giant Studebaker, and park that under my giant NCR cash register. I only wish the Egyptians had been into this sort of thing, imagine how much more entertaining archaeology would be when they uncovered something like this. All we can do now is hope that in 1000 years or so some of this stuff will have them scratching their heads. Have you read ‘Motel of the Mysteries’ by David Macaulay? try to infer the society that used it. There’s a novel with the same premise. ‘The Weans’ by Robert Nathan. I heard a SF radio adaption of that once. Nik got it right, using the diameter dial as a scale of 4 feet the woman works out to be six feet eleven and three quarters inches tall and she’s not even standing upright! Howver, note the “candlestick” phone on the table. 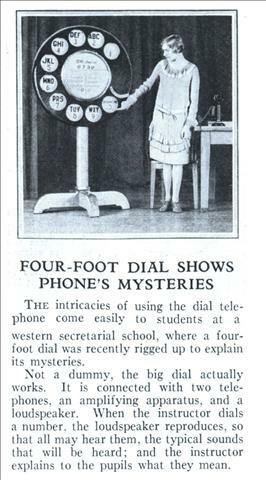 These were typically 11.75 inches tall so using that scale, the telephone dial is an even 3 feet in diameter and the woman is a reasonable five foot two and a half (still not standing upright). people actually felt the need for classroom instruction in dialing a rotary phone?! as i recall, my mother taught me that in three sentences. when i was six. Nomen, I’m guessing that if they got the size of the dial wrong, perhaps they got the purpose wrong as well. Much like every oversized display in science museums everywhere, I think the giant dial was more to show how the rotary phone worked rather than how to use it. I love “Motel of the Mysteries”. Its very funny, but really gets across that much of archeology is guesswork. My favorite is the illustration with the man wearing a toilet seat as a necklace. Nescio, you’re neglecting the fact that you had a phone in your home. In 1931 the chances of these young ladies growing up with a phone in the house much less being able to touch it were slimmer than you might realize today. So yeah, it kinda made sense for them to learn how a phone works. Especially since the bulk of those 8.7 million phones would have been in businesses. When I was a young (and dinosaurs ruled the earth) you only needed to dial the last 4 digits of the phone number unless you were calling outside of your home exchange. The phone company would come around to the elementary schools with a telephone trainer and they would show a movie and then they would have the children try out what they learned on the trainer. I wish they still did this as many younger people out there really do need to learn how to answer and talk on the phone. Okay, Jay: what do you do when you need to transfer the call? Not now, but in 1931? Do you know? If the caller is calling from your local exchange, you depress the latch quickly twice, then dial the extension number of the phone you’re transferring to, then click the latch once and hang up. If the caller is not calling from your local exchange, you depress the latch twice, dial the number, and click the latch twice. How do you tell whether a caller is calling from your local exchange? By the ring in some areas, by the number of clicks you hear when the call goes through in others, by the operator in still others. By local exchange I mean your neighbourhood, by the way. Would you like some more examples? BTW, I found a book on this! My dad owned everything! The original dial phone could called <9000 others more then was needed for a big city, or the time. As the dial turned it operated relays in the office that moved a switch that would wait for the next turn of the dial. The last switch took the last two digits 10 up and 10 across. Latter the first three digits (prefix) were added, this made it possible to call <900000 outers. Each pair of wire (2 wires), from the office, had as many as 16 phones, each with a different distinctive ring. I was told in 1965 that at no tine would every family on a block have their owe phone, and only the ultra rich would have more than one phone in there house. I now have three. Sadly the skill to build and maintain that type of equipment has been lost. It was not better or worse just different. Hmm… I have a 1994 Panasonic Fax missing Q and Z alphabets like that ancient dial. And to think, just a week ago I watched my youngster train my wife to burn a DVD across our home network.Â Go figure. Wait. There isn’t a link to a youtube video? What? There wasn’t any student recording it with his mobile phone? Jeez. 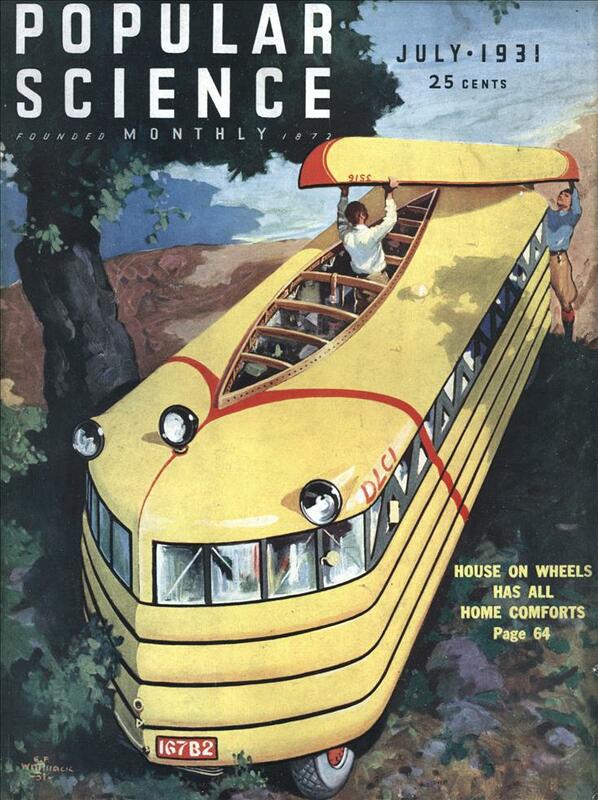 1931 doesn’t look that far ago. Bakeite Girl… Is your nickname an indication of your former profession and interest in vintage telephones? I think the kids could figure it out, but I’d like to see a YouTube of it. A news report showed a kid explaining that LPs were used to play music in the ‘olden days’ ! One of the Arthur C. Clarke novels set thousands of years in the future featured Star Trek style food replicators…. I have a pic that has a woman with a huge phone in her hand. and it says it’s humurous. whereubeat2715 yahoo messenger. a humurous classis might i say.